Now a days we are getting a lot of notification/news regarding linking Aadhaar Card with PAN Card and there are also some rumour that your PAN card will be invalid if you will not link your Aadhaar number with PAN card before 01st July 2017. We would like to clear your doubt that your PAN will be STILL VALID after the 01st July 2017, CBDT has said that PAN will be invalid in future if not linked with Aadhaar but they have not given any DEADLINE regarding this.So, don't worry still you have time to link your Aadhaar number with PAN card. 1. Visit income tax website. 2. Enter your PAN Card number. 5. If your Aadhaar doesnot have actual date of birth but it contains only year of birth then select checkbox "I have only year of birth in Aadhaar Card". 6. 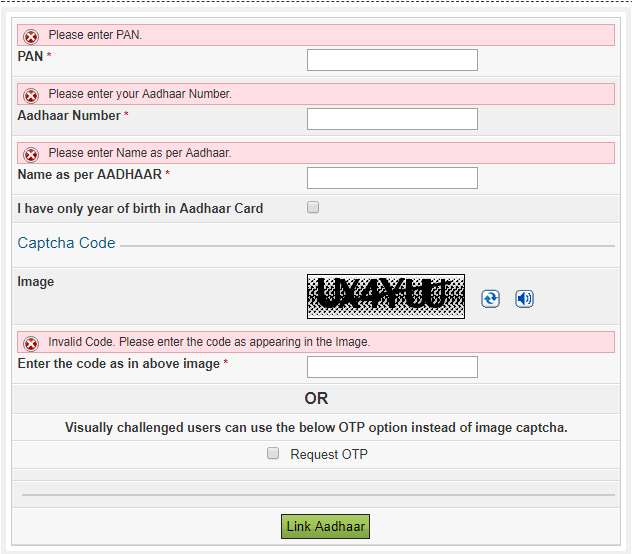 Enter capcha code and click "Link Aadhaar" button to link it successfully. On successful linking you will get the message Aadhaar-PAN linking is completed sucessfully. If you get the error "Technical error at UIDAI. Please try again" then try with "Request OTP" option to successfully link this. Note:- If date of birth and Gender matching in Aadhaar and PAN card but name is exactly not matching then select "Request OTP" to proceed. Even after trying with "Request OTP" option, I am getting "Technical Error at UIDAI" message. What could be the issue here? Try again it should work.